Karun Sharma, M.D., is working with AeRang Kim, M.D., Ph.D., to evaluate the use of ThermoDox®, a heat-activated chemotherapy drug, in combination with noninvasive magnetic resonance-guided high-intensity focused ultrasound (MR-HIFU) to treat refractory or relapsed solid tumors in children and young adults. A Phase I Study of Lyso-thermosensitive Liposomal Doxorubicin (LTLD, ThermoDox®) and Magnetic Resonance-Guided High Intensity Focused Ultrasound for Relapsed or Refractory Solid Tumors in Children, Adolescents, and Young Adults. PI: AeRang Kim, M.D., Ph.D. This study is looking to determine the maximum tolerated dose (MTD) and recommended phase 2 dose (RP2D) of lyso-thermosensitive liposomal doxorubicin (LTLD), a heat-activated formulation of liposomal doxorubicin with unique property of heat-activated release of doxorubicin, administered in combination with magnetic resonance-guided high-intensity focused ultrasound (MR-HIFU) in children with relapsed/refractory solid tumors. MR-HIFU is an innovative device that provides precise and controlled delivery of heat inside a tumor using an external applicator. Unlike other heating systems used in local therapy, MR-HIFU is entirely non-invasive and does not use any radiation. Integration of MR imaging allows for real-time temperature monitoring for accurate and precise targeting of tumors. LTLD is a novel formulation of doxorubicin with the unique property of heat-activated release. This selective drug delivery mechanism allows for local and rapid release of doxorubicin in high concentrations in tumors when heated. This novel combination may potentiate known effective therapy to improve local control and drug delivery without increasing toxicity. Children’s National Health System and Celsion Corp, a leading oncology drug-development company, were the first to launch a clinical study in the U.S. that evaluates the use of ThermoDox® with MR-HIFU. Learn more about the clinical trial. View more open phase 1 and phase 2 cancer clinical trials at Children’s National. The Children’s National Center for Cancer and Blood Disorders is committed to providing the best care for pediatric patients. Our experts play an active role in innovative clinical trials to advance pediatric cancer care. We offer access to novel trials and therapies, some of which are only available here at Children’s National. With research interests covering nearly aspect of pediatric cancer care, our work is making great advancements in childhood cancer. Doctors from the Sheik Zayed Institute for Pediatric Surgical Innovation at Children’s National Health System have completed a clinical trial that demonstrates how osteoid osteoma, a benign but painful bone tumor that commonly occurs in children and young adults, can be safely and successfully treated using an incisionless surgery method called magnetic resonance-guided high-intensity focused ultrasound (MR-HIFU). Published in The Journal of Pediatrics on Aug. 17, 2017, the study compares nine patients, ages 6 to 16 years old, who were treated for osteoid osteoma using MR-HIFU with a nine-patient historical control group, ages 6 to 10 years old, who were treated at Children’s National using radiofrequency ablation (RFA) surgery, the standard treatment at most U.S. hospitals. The study results show that treatment using MR-HIFU is feasible and safe for patients, eliminating the incisions or exposure to ionizing radiation that is associated with the RFA procedure. 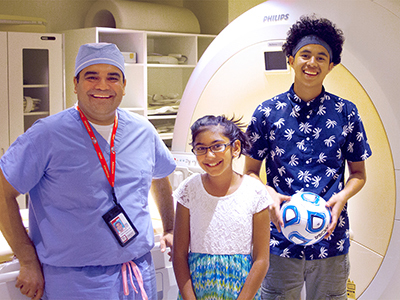 Children’s National is the first U.S. children’s hospital to successfully use MR-HIFU to treat osteoid osteoma. CT-guided RFA, the most commonly used osteoid osteoma treatment, requires drilling through muscle and soft tissue into bone and also exposes the patient and operator to radiation from the imaging necessary to guide the probe that is inserted to heat and destroy tumor tissue. High-intensity focused ultrasound therapy uses focused sound wave energy to heat and destroy the targeted tumor under MRI guidance. This precise and controlled method does not require a scalpel or needle, greatly reducing the risk of complications like infections and bone fractures. It is also a faster treatment option, with expected total procedure time of 90 minutes or less. In the U.S., MR-HIFU is used to treat uterine fibroids and painful bone metastases from several types of cancer in adults, but has not previously been used in children. This breakthrough is the latest from the Image-Guided Non-Invasive Therapeutic Energy (IGNITE) program, a collaboration of the Sheikh Zayed Institute and the departments of Radiology, Oncology, Surgery, and Anesthesiology at Children’s National. 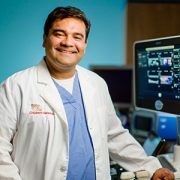 The goal of the IGNITE program is to improve the quality of life and outcomes for pediatric patients through the development and clinical introduction of novel minimally invasive and noninvasive surgery technologies and combination therapy approaches. The team is led by Peter Kim, M.D., Ph.D., vice president of the Sheikh Zayed Institute. In addition to Drs. Sharma and Kim, the Children’s National team for the ablation of osteoid osteoma clinical trial included: AeRang Kim, M.D., Ph.D., pediatric oncologist; Matthew Oetgen, M.D., division chief of Orthopaedic Surgery and Sports Medicine; Anilawan Smitthimedhin, M.D., radiology research fellow; Pavel Yarmolenko, Ph.D., Haydar Celik, Ph.D., and Avinash Eranki, engineers; and Janish Patel, M.D., and Domiciano Santos, M.D., pediatric anesthesiologists. Ari Partanen, Ph.D., a senior clinical scientist from Philips, was also a member. Karun Sharma, M.D., poses with two patients who participated in the MR-HIFU trial for pediatric osteoid osteoma. 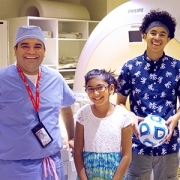 Doctors from the Sheikh Zayed Institute for Pediatric Surgical Innovation and surgeons from Children’s National are the first in the U.S. to use Magnetic Resonance-Guided High-intensity Focused Ultrasound (MR-HIFU) to treat pediatric osteoid osteoma. 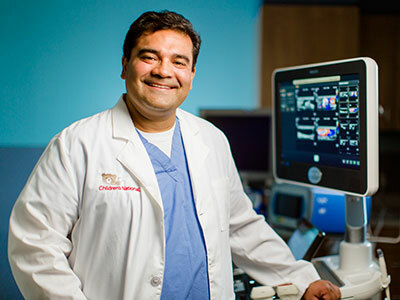 The trial, led by Principal Investigator Karun Sharma, M.D., Ph.D., Director of Interventional Radiology at Children’s National, began in 2015 and is demonstrating early success in establishing the safety and feasibility of noninvasive MR-HIFU as an alternative to the current, more invasive approaches to remove tumor tissue. Osteoid osteoma is a painful, but benign, bone tumor that commonly occurs in children and young adults. Removal generally requires orthopaedic surgery to scrape the tumor from the bone or CT (computerized tomography) image-guided radiofrequency ablation (RFA), which is less invasive than surgery but is associated with ionizing radiation exposure and requires drilling through muscle and soft tissue into bone. MR-HIFU, on the other hand, is a precise and controlled method that does not require a scalpel or needle, greatly reducing the risk of complications, including infections and bone fractures. Even better, it promises reduced procedure time, typically an hour or less. “The use of MR-HIFU ablation of osteoid osteoma is a perfect example of our mission in the Sheikh Zayed Institute to make pediatric surgery more precise and less invasive,” adds Peter Kim, M.D., C.M., Ph.D., Vice President of the Sheikh Zayed Institute, who leads the Image Guided Non-Invasive Therapeutic Energy (IGNITE) program. 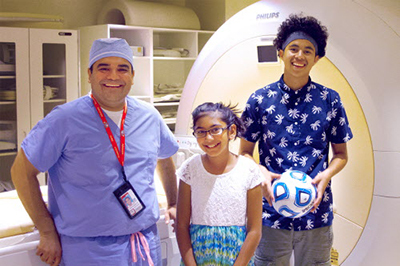 IGNITE is a joint clinical and research collaboration between the Sheikh Zayed Institute and the Divisions of Radiology, Oncology, Surgery, and Anesthesiology at Children’s National. MR-HIFU is also being used to treat pediatric refractory soft tissue tumors, a first-in-the-world clinical trial that is a collaboration between Children’s National and the NIH Center for Interventional Oncology directed by Bradford Wood, MD. Additionally, the IGNITE team has started preliminary work to explore applications of MR-HIFU for noninvasive ablation of growth plates and pediatric solid tumors. In addition to Drs. Sharma and Kim, the team for the ablation of osteoid osteoma clinical trial includes: AeRang Kim, MD, PhD, pediatric oncologist; Matthew Oetgen, M.D., Division Chief of Orthopaedic Surgery and Sports Medicine; Kaleb Friend, M.D., pediatric orthopedic surgeon; Pavel Yarmolenko, Ph.D., Haydar Celik, Ph.D., and Avinash Eranki, biomedical engineers; Viktoriya Beskin, MR technologist; and Janish Patel, M.D., and Domiciano Santos, M.D., pediatric anesthesiologists. 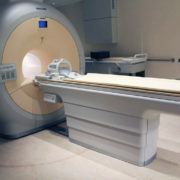 Children’s National Health System and Celsion Corp., a leading oncology drug-development company, will be the first to launch a clinical study in the U.S. that evaluates the use of ThermoDox®, a heat-activated chemotherapy drug, in combination with noninvasive magnetic resonance-guided high-intensity focused ultrasound (MR-HIFU) to treat refractory or relapsed solid tumors in children and young adults. The investigator-sponsored Phase I study, which is partially funded by an NIH R01 grant, will determine a safe and tolerable dose of ThermoDox, a lyso-thermosensitive liposomal doxorubicin (LTLD), which can be administered in combination with MR-HIFU. Under the guidance of an MRI, the high-intensity focused ultrasound directs soundwave energy to heat the tumor and the area around the tumor. When heated, the liposome rapidly changes structure and releases doxorubicin directly into and around the targeted tumor. This is the first time LTLD is being combined with MR-HIFU and the first time it is being evaluated in children. 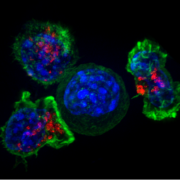 The study targeting the treatment of childhood sarcomas will be carried out as a multidisciplinary collaboration between Children’s National, Celsion, and Dr. Bradford Wood’s team at the National Institutes of Health. 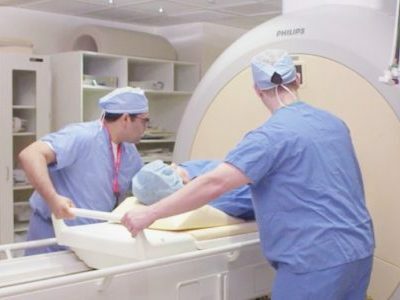 This is the latest study from the Image-Guided Non-Invasive Therapeutic Energy (IGNITE) program, a collaboration of the Sheikh Zayed Institute for Pediatric Surgical Innovation at Children’s National and the pediatric health system’s Divisions of Radiology, Oncology, Surgery, and Anesthesiology. The goal of the IGNITE program is to improve the quality of life and outcomes for pediatric patients through the development and clinical introduction of novel minimally invasive and noninvasive surgery technologies and combination therapy approaches. In 2015, doctors from Children’s National were the first in the U.S. to treat osteoid osteoma, a benign and painful bone tumor, using MR-HIFU. ThermoDox is currently in late-stage clinical trials in primary liver cancer and recurrent chest wall breast cancer. It is positioned for use with multiple heating technologies, and has the potential for applications in the treatment of other forms of cancer including metastatic liver and nonmuscle invading bladder cancers.